Handcrafted by legendary course designer, Dr. Michael Hurdzan, Drumm Farm Golf Club is built over approximately 280 acres of preserved farmland located in the heart of Independence, Missouri. 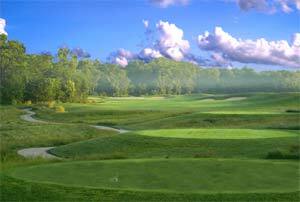 The 7,121 yard, par 72 Championship course is designed around meandering creeks and rolling fairways. Players will enjoy zoysia fairways, well-manicured bent grass greens, and five sets of tees to make the course enjoyable for golfers of all skill levels. Under the new guidance of GreatLife Kansas City, Drumm Farm Golf Club has become a venue that has something to offer to everyone.